Itsu are a chain of sushi restaurants/takeaway shops dotted around London, mostly in places with lots of office workers. Their restaurants, like Yo Sushi, feature conveyor belts where the little plates of sushi go round and round and round and round and you just take what you like; the plates are colour-coded to let the staff work out your bill at the end. They also have what they call "shop" branches, some of which have seating; instead of conveyor belts, the "shops" have pre-packed sushi boxes in fridges. 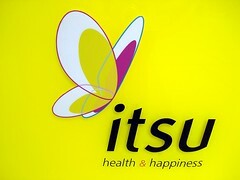 Itsu is a British chain, invented by Julian Metcalfe, the man behind Pret a Manger. In general, the quality is higher than at Yo Sushi. The fish certainly seems fresher. Last edited 2008-08-01 19:26:34 (version 6; diff). List all versions. Page last edited 2008-08-01 19:26:34 (version 6).